Gloucester Estampie (2010) for organ was commissioned by The Memorial Church at Harvard University for the farewell celebration recital series for the C. B. Fisk, op. 46 (1967) organ. 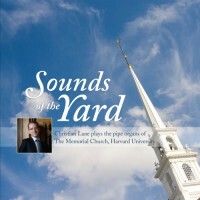 The work is dedicated to organist Christian Lane who presented the world premiere on the instrument’s final Harvard recital on May 3, 2010. (The title refers to Gloucester, Massachusetts—home of C. B. Fisk organ builders.) The work is based on the Medieval estampie form and draws its energetic trajectory from this repertoire. The estampie form consists of a series of phrases entitled “puncta” that are each immediately repeated. Formally this work is structured as an “estampie within an estampie”—after the loud opening section, a Medieval-esque estampie is quietly presented. However, this internal estampie is also one “puncta” in the larger estampie that is the entire piece. As the further repetitions and aggregates build up, the material continues to be harmonically elaborated from its first, simple presentation—all building towards a joyous conclusion.